The perfect combination of 13 hours of DVD instruction in all areas of chess, with over 3,000 interactive chess positions to test your knowledge. Includes full sets of Complete Chess Course (Opening Principles, Tactics and Strategy, and Endgames), Chess Opening Ideas (Open Games 1.e4 e5, Semi-Open Games 1.e4 non-e5, and Closed Games), and the popular interactive CD-ROM learning and testing programs. Watching the whole DVD courses and testing your skills are guaranteed to increase your level at chess significantly, especially if your rating is between 0 and 1700 Elo. 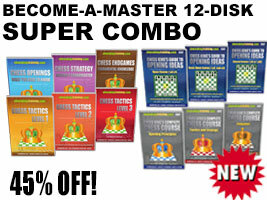 Add Chess King for $39 or Chess King Pro for only $89.